The Human Torch was one of the “big three” heroes of Marvel (then known as Timely) Comics, along with Captain America and the Sub-Mariner—and one of the most popular Marvel superheroes of the 1940s. Like the Sub-Mariner, he was first seen on the newsstands in Marvel Comics #1, in late 1939. Historians believe that the Sub-Mariner came first and that the Torch was created by Carl Burgos as a counterpart to his friend Bill Everett’s aquatic hero. Both artists worked in the Funnies Inc. sweatshop and were among several creators involved in packaging together the first of a new comic line for pulp publisher Martin Goodman. The comic, and particularly the Torch and Sub-Mariner characters, proved a hit, and Timely soon grew to become one of the era’s biggest companies, eventually emerging as the Marvel Comics that readers know today. As the story in Marvel Comics #1 reveals, the Torch is an android created by Professor Phineas T. Horton, which accidentally bursts into flames when exposed to oxygen (due to a design flaw). Disappointed by his failure, Horton buries the poor creature in a glass tomb and sinks it in concrete. But when an explosion accidentally releases the Torch, he rampages through a nearby town, causing chaos wherever he goes. Befriended by a crook called Sardo, the Torch is lured into a life of crime until rescued by Horton, who has his own agenda. Seeing that the Torch can now control his flame, Horton plans to exploit the Torch’s powers for his own gain. Disgusted by the professor’s greed, the Torch heads off on his own, to right injustices wherever he encounters them; and he soon signs up as a member of the police department (adopting the alter ego Jim Hammond, though this temporary device is not well-remembered today), rushing to the scene of any crime or disaster. The war was a boost to Timely/Marvel’s heroes and they were among the first to take the fight to the Axis powers. While the Torch never really developed any arch-enemies, he was constantly battling the Nazis and Japanese, in between rooting out spy rings and racketeers. Another innovative feature of the Human Torch strip was his many battles with his co-star and rival the Sub-Mariner. The first of these appeared in Marvel Mystery Comics #8. The pair’s longest battle stretched to an astonishing sixty pages (in Human Torch #5) and ranged across the whole planet, taking in Axis plots and vast warring armies. Burgos, Everett, and their Funnies Inc. colleagues would hole themselves up in hotel rooms and work for days on end, churning out these mammoth tales, to meet their fans’ insatiable demand. While sometimes crude, these epics have an incredible energy and dynamism to them that still excites today. The Torch, it seems, had been covered by a flame-retardant solution and buried in the desert by “the crime boss” until he was freed by a nuclear test blast five years later. Toro had been captured and brainwashed by the Koreans, and the Torch’s first task was to free him from their control. Together again at last, the pair took up from where they had left off, tackling organized crime (and bashing the occasional “red” in the process). Their resurrection led to the revival of the Torch’s own comic and to appearances—many by Burgos—in further issues of Young Men, Sub-Mariner, Captain America, and Men’s Adventures, but within a year the Torch was canceled once again. When, in 1961, fans next discovered a comic starring the Human Torch on the stands (Fantastic Four #1), it was a totally different Torch, Johnny Storm. Following DC Comics’ success with its new superhero line, Martin Goodman decided that the time was right for his own company to reenter the genre, and when writer Stan Lee and artist Jack Kirby set about dreaming up a new title, someone clearly remembered the first Torch’s success. Although Johnny Storm is an integral member of the Fantastic Four, he has rarely enjoyed solo success; his main ventures outside the group have been an early run in Strange Tales (issues #101-#134) in the early 1960s (one episode of which was drawn by Burgos), and a solo series targeted at young readers that flared up in 2003. In 2011, Johnny Storm was seemingly killed off, but it is surely inevitable that he will eventually turn up alive. Writer and comics historian Roy Thomas always had a fondness for the first Torch, and in 1975 created The Invaders to recount further wartime adventures of the Timely Comics “big three” (including Captain America and SubMariner, and adding Toro and Captain America’s sidekick Bucky to the group). That title’s cancellation, in 1979, might have marked the last hurrah for the first Torch. But one should never say never where marketable properties are concerned, and by the late 1980s continuity had been revised so that the original Torch had not been transformed into the Vision and could fly again, first as a member of the West Coast Avengers and later with the Heroes for Hire. Writer Kurt Busiek further amended continuity in Avengers Forever (1998–1999), establishing that due to a time paradox, the Vision had indeed been constructed from the original Torch’s body, yet the Torch himself continued to exist as a separate being. Before Chris Evans was the honorable Captain America, he was the cheeky Human Torch. Jordan ( The Wire, Fruitvale Station ), the guy who played the Human Torch in the recent Fantastic Four reboot. CORRIE'S Debbie Rush tells me she had to think twice about being turned into a human torch for TV - because her husband nearly died from severe burns. But before agreeing to be a human torch she sounded out her husband Andrew, who suffered in a terrifying childhood accident. Author Jamie Reid's mission statement in writing Blown was to redress the omission of the Paris-born son of a trainer and horse-dealer from the more glorious histories of the Special Operations Executive - the government's human torch with which it intended to "set Europe ablaze"; and he does so with vim and vigour, portraying Goldsmith as a brave, dashing and resourceful special agent who escaped torture and certain death by shinning along the ledge of a fifth floor window of a Paris hotel, only to return to the fray amid the perils of betrayal and treachery. I remember running through a puddle of petrol to get out and I basically turned into a human torch. 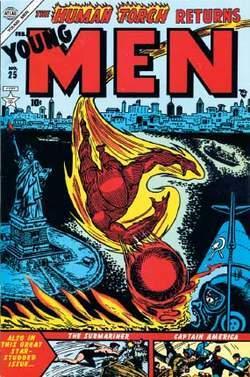 Debuting in 1939 alongside Timely Comics' Human Torch in Marvel Comics No. Fantastic, The Thing, The Invisible Woman and The Human Torch respectively. South Bank-born Duffy led a charmed life - ignoring two shotgun woundings and an attempt to turn him into a human torch. The human torch was really a stunt double, so there was never any danger of Robbie losing his cool. What the blazes is Rob up to? It's one thing to star in a superhero movie, says Evans, who previously played the Human Torch in two Fantastic Four movies. American actor Chris Evans, who starred as the Human Torch in the Fantastic Four movies, takes the title role of the patriotic masked crusader.